Northern Ontario faces development similar to the Alberta tar sands. 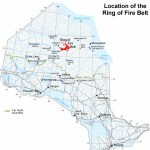 I’m looking at a map of northern Ontario’s Ring of Fire. It’s a pretty patchwork of colours in the shape of a crescent moon: deep sea-blue for Freewest Resources, orange for KWG, bright sun-yellow for Probe, grass green for Fancamp, sky-blue for the Freewest/Spider/KWG partnership. They are some of the thousands of claims staked by mining companies in the Ring of Fire — 5,120 square kilometres in the water sheds of Hudson and James Bays and chock full of chromite, nickel, copper and zinc worth well over $100 billion. That’s a sizable chunk of boreal forest, itself a carbon sink of the order of the Amazon rain forest. Imagine you are on the shore of McFaulds Lake. You’re looking at trees and rock and muskeg — swampland — millions of acres of it. Turn around and you’ll see KWG’s base camp and maybe a drill or two pulling up core samples of chromite. Think Ontario’s oil sands. Thunder Bay is Fort McMurray — an analogy Mayor Hobbs himself uses. Well why not? you ask. There’s nothing there. No so. It’s home for everyone from black flies to black bears to First Nations peoples, Cree and Anishinaabek, whose ways of life will be forever altered if and when all those pretty coloured claims become mines. Think Ontario’s oil sands. Thunder Bay is Fort McMurray — an analogy Mr Hobbs himself uses. Everyone, including the Mayor, wants to “do it right.” But doing it right is where everything can go wrong. Mining companies, rightly, want to make a profit. Shareholders, rightly, want a healthy return on their investment. Municipalities want jobs and new infrastructure. The Crown wants royalties (and votes). Environmentalists want to preserve the environment. First Nations want all these things. They are not opposed to development as long as it doesn’t turn the land inside out. So, they are banking their future on fair and proper consultation. Into this ring of fire walks Bob Rae. He is now the lead negotiator for the Matawa Tribal Council, nine Anishinaabe First Nations in the area most directly impacted by the thousands of claims on the road to becoming mines. In making the law on consultation, the Supreme Court of Canada said that, done right, it will lead to reconciliation between Canada and Turtle Island. But reconciliation demands accord between peoples of very different cultures and status. And that requires trust where there is none, and a kind of understanding that must go far beyond tolerance, which itself is in short supply. It demands legislative flexibility where the law is becoming more hidebound and ideological. It will take enormous patience from a public impatient with Turtle Island’s impoverished circumstances and First Nations’ demands for relief from those circumstances. The feds were last seen opposing Matawa’s attempt to introduce expert evidence during a Judicial Review of the government’s decision to hold a Comprehensive Environmental Assessment on a Cliffs Resources project. That process would exclude effective participation from First Nations. Cliffs (an American chromium mining company) brought a similar motion. Matawa won that round. A decision on the legitimacy of the EA is expected in September. Now, I know he’s is not the only one on his side of the table. And I know that the Anishinaabek have a way of mapping out their own path whether we like it or not. Nevertheless, one of those ridiculous old high school football chants has dogged me since our first conversation. And that’s what frightens me. David McLaren has worked for government, the private sector, arts groups, environmental groups and First Nations in communications and policy analysis. He is an award-winning writer living at Neyaashiinigamiing (Cape Croker) on the Bruce Peninsula in Ontario, who finds himself in Toronto temporarily. Error! Calgary columnist ties death to Insite Information breakthrough in Nova Scotia!